Fate of Indines is a low-cost starter box for BattleCON! Featuring 10 fighters, Fate of Indines gives you the essentials to play BattleCON anytime, anywhere, and is the perfect place to get started on the series. These new fighters are fully compatible with all existing BattleCON games, so you can expand your collection and get a travel-sized box and board at the same time! Includes 10 different Fighters to master, each with a unique new core mechanic. Quick-start Comic rules that get you right into the action of the game! Try the new force Gauge Variant, never before seen in a BattleCON base game! NOTE: This game was created and released as a free reward to pledgers of the BattleCON: War of Indines Remastered Kickstarter. It has been made available for purchase through retail outlets. 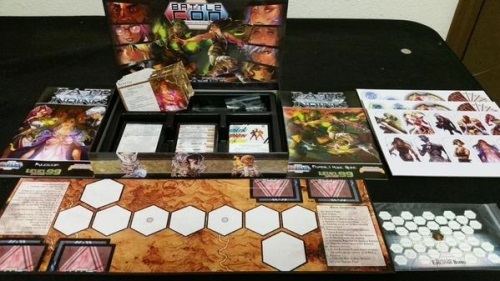 Add a Review for "BattleCON: Fate of Indines"